HERO Who Made Rizal our Hero? How Much do You Know about Pepe? Who Made Rizal our National Hero? 3 Facts About Rizal The streets around espanya was Rizal’s pen names that he used in writing articles that opposes the side of the Spaniards. Jose Rizal’s real name is Jose Protacio Rizal Mercado y Alonso Realonda and is born on June 19,1861 at Calamba, Laguna. Rizal was called “Pepe” and “Jose” by his family members, friends and relatives. His famous novels are Noli Me Tangere and El Filibusterismo. And his death is on December 30, 1896 in which we celebrate every 30th of december every year known as the “Rizal Day”. Rizal knows many languages at a very young age. And his IQ is high and he was able to study several fields of study and he also had varying degrees of expertise. DEATH Rizal’s last words before he died were those said by Jesus Christ: “consummatum est” which means it is finished. Rizal has a third novel that he did not finish, and entitled “Makamisa”. It is Rizal’s unfinished work that he started at Hong Kong in the year 1892. “Makamisa” was not the actual title of the book but it was the title of the first chapter of the book so they only call it by the title of the first chapter because it is unfinished. He was also known as the “Father of comics” because of some of these illustrations he made in Germany. The picture on the left is entitled as “The baptism of two brothers” and it was inspired by the german cartoon “max and moritz”. He made this illustration to entertain the children of his landlord. Rizal made a name for himself as a writer, propagandists, artist, and most commonly as the Philippines National Hero. Since his execution, his name has garnered different beliefs and ideas defining his character. Some of these beliefs and ideas however pertain to Rizal as the Holy Spirit sent to liberate the Philippines not only from the Spanish occupiers but also to liberate the Nation in the end of days. Rizal the Holy Spirit, in this regard, is believed to be a resemblance of an old man with an authoritative attitude much like a grumpy yet wise old man appearing only to a select few and speaking to them directly. To those select few Rizal passes his messages and instructions to be followed by the sect, much like in the old testament. Some instructions that Rizal announces are those of oaths of chastity, abstinence from eating meat, and dressing modestly Like most deities, Rizal the Holy Spirit, is also believed to have miraculous powers that will aid the nation in its time of need. These supernatural powers include healing, and passing on wisdom both from the future and the past. RIZAL: A MYTH Rizalâ&#x20AC;&#x2122;s trial and execution by the Spanish authorities made him have quite a popular image among Filipinos, to the point that he came to be viewed as the Filipino Christ. Part of the doctrine of the Rizalista societies is that Rizal would return and resurrected from deep inside Mt. Makiling, which is located at his birthplace, Calamba, Laguna. With his return, he will save and liberate the Filipino nation once again. One response to this has been an attempt to reinterpret this belief and reintroduce him as the hero that he was and not the God that they worship. 13 Who Made Rizal Our Hero? William Howard Taft He was an American Governor-General in the Philippines. 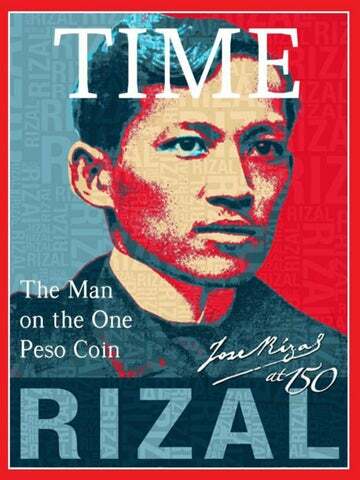 He declared Jose Rizal as the national hero for the Filipinos. “Rizal” was their password before entering their hideout. They had a portrait of Rizal in every KKK camp. During the American Period, Rizal was a common image on Philippine stamps His portrait spread all over the world He became even more popular after his death Statues of Rizal were erected everywhere, in the Philippines and places in abroad where he walked and every public school and town plaza. Fort Santiago is known for it being the place where Rizal spent his last days before his execution in Bagumbayan (present day Luneta or Rizal Park). Rizalâ&#x20AC;&#x2122;s footsteps were embedded gold on the ground to signify his bravery and martyrdom for our beloved country, the Philippines. On the other parts of the museum, his actual prison cell is also well preserved and could be viewed by museum visitors. From there, Rizal wrote his last poem, Mi Ultimo Adios (My Last Farewell), and his letters to his family especially to Paciano, his brother. Fun fact: The prison cell served as a witness for the love that Jose Rizal and Josephine Bracken had and according to historians, this place is where the couple embraced for the last time. For more updates, visit our website and contact us for latest news. Grab your own copy!